This page is for the PC port of the console game developed by Luxoflux. 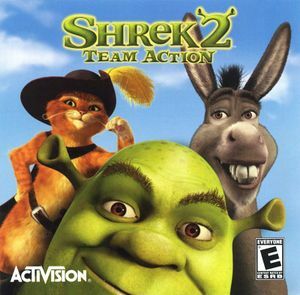 For the original PC game developed by KnowWonder, see Shrek 2: The Game. The game's built-in Vsync limits gameplay to 38FPS, while cutscenes are unaffected. See High frame rate. CD-ROM used only for installation. Frame rate can drop in detailed environments; can be offset by enabling "distance clipping" in the launcher and adjusting accordingly. Game's default Vsync limits gameplay to 38FPS while cutscenes are uncapped. See Force Vsync. 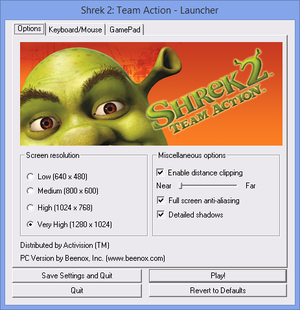 Open Shrek 2.exe in a hex editor, e.g. HxD. Search for 7C 46 83 F9 06 7D 41 and replace it with 7C 00 83 F9 06 7D 00. Camera sensitivity is increased with higher FPS. Fiona's time stopping ability lasts for less time the higher the FPS, there may also be other minor issues. Launcher Keyboard and Mouse settings. Game has an option to 'Invert Up/Down', but doesn't appear to actually invert anything. Game shows modified Xbox buttons, with graphics instead of letters. Up to one keyboard/mouse player is allowed to play. 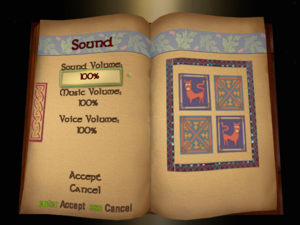 Sound effects are faint compared to music and voices, even when all sliders are maxed out and the music can cut out at random. Tested on Windows 10 64-bit. This page was last edited on 13 April 2019, at 08:55.